Switching to a new cloud service is never going to be an easy task for an organization, especially when terabytes of data owned by hundreds of users needs to be migrated. In this tutorial, we will show you how enterprises can transfer files and users along with permissions from Box to OneDrive for Business (ODFB) using CloudFuze’s cloud file transfer app. From strategizing to executing, the page provides complete information about Box to OneDrive migration. 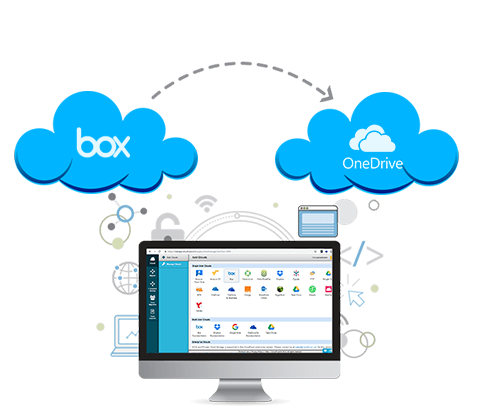 CloudFuze offers a quick, secure, and convenient way of transferring files from Box to OneDrive. The tool helps businesses of all sizes, especially enterprises, automate cloud data migration, thus saving valuable time of IT teams. Planning plays a crucial role in the successful completion of the migration project. The following are some of the key areas to focus while contemplating to switch to OneDrive from Box. What is the size of data to be moved? How many users need to be migrated? The total size of the data stored in Box account impacts the migration project in a big way. The amount of money an organization is going to spend and the time it takes for the migration to complete depends on the size of the data. User migration is something consumers don’t have to worry. When it comes to businesses, the number of users, along with the data size, influences costs and timelines. Irrespective of the data size, fewer folders mean quicker migration. Hundreds and thousands of files or a deep folder structure could increase the duration of migration. Figuring out the number of files and assessing the folder structure before migration help meet project deadlines better. Calculating the average size of a file in their Box account would also help organizations estimate file transfer speed accurately. The following picture shows you how the individual and shared folders look like in Dropbox and OneDrive. Retaining and migrating permissions and file sharing rules is the most critical part of a cloud storage migration project. Unlike single-user cloud storage platforms, enterprise content management systems have complex file sharing and access permissions between multiple users. CloudFuze’s migration engine ensures secure delivery of not only files and folders but also the permissions. Check the table to find out how user roles change from Box to OneDrive. The table below describes how sharing works in Box and OneDrive. A file or folder with one owner and more than one contributor. The file/folder goes into OneDrive personal library. Collaborators can find the file/folder in the “Shared with Me” section. Files or folders with co-admins. The files or the folders go into in the respective shared libraries. Files or folders with external Box contributors. Any content that belongs to Box users outside of an organization can’t be transferred. Factors such as invalid characters in file names, complex file paths, and file upload limits make or break a successful migration. Hence, the IT team of an organization must pay a lot of attention to these technical elements. This Microsoft OneDrive/SharePoint resource can help IT admins or managers analyze their content that’s currently in their Box account and assess the compatibility with OneDrive. CloudFuze’s migration platform tackles most of these problems effortlessly, thus making the transition from Box to OneDrive as smooth as possible. The duration of migration depends on several factors. We put up a list below for a quick reference. Get in touch with CloudFuze for an accurate assessment of project timelines. Organizations must work on an onboarding plan and have it aligned with the overall migration project. User adoption is one of the biggest post migration challenges that businesses usually face. Despite extensive training, some employees may resist using the new platform. It is advised that IT teams don’t decommission Box abruptly. The ideal way of overcoming user adoption challenges is to provide early access of OneDrive to users, weeks before the migration is initiated. Extensive training may be required to make sure that employees begin using OneDrive correctly. Lack of platform knowledge could pose a serious security risk. 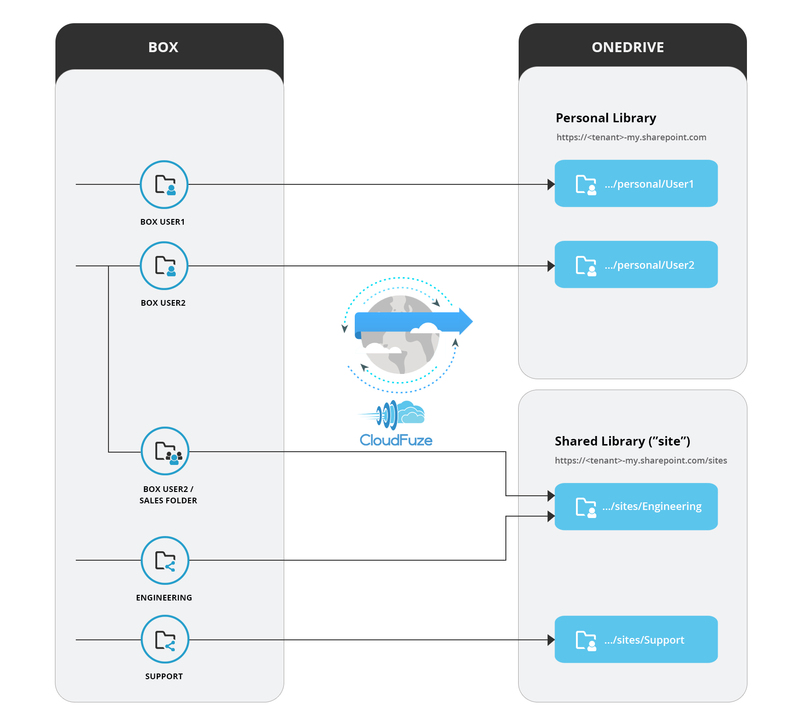 By using CloudFuze to transfer your Box files to OneDrive, you are working with a fully supported system that boasts massive migration capabilities. The app can efficiently migrate petabytes of data and hundreds of users in just days, not months. CloudFuze is highly secure and backed by the state-of-the-art server infrastructure that transfers up to 7 terabytes of data in one hour. You must have a CloudFuze account to initiate the migration. You can create an account to test the service or contact us for more details. If you need to migrate a lot of data or a big number of users, we recommend that you get in touch with our support team. Once you create and log in to your account, you will be shown a list of cloud services supported by CloudFuze. To proceed, you must add your source (Box) and target (OneDrive for Business). Click on the Box icon and enter your admin login credentials to authorize the account. Keep in mind that CloudFuze uses OAuth protocol for cloud authorization. The platform can’t access or save your Box login credentials. Click on the OneDrive for Business icon and authorize your account with admin credentials. In addition to OneDrive for Business, CloudFuze also supports Box and SharePoint Online migration. Click on the Team Migration icon on the left navigation menu and choose your source and target clouds. Please make sure that you chose Box as source and OneDrive as destination. Click on the Auto Map button, which is seen in the middle of the page, to auto map users. Upon clicking on the Auto Map button, the system lists down all the users in Box that can be migrated. Choose a few users or all as per your requirement. Preview the migration job and click on Start Migration button. The migration will be initiated, and the status can be seen on this final page. Just click on the names of the migration jobs to see the detailed reports for each migration. That’s it! CloudFuze offers semi-managed migration services for enterprise clients who don’t wish to use the self-service model. Please chat with our support team or send an email to support@cloudfuze.com for more information.